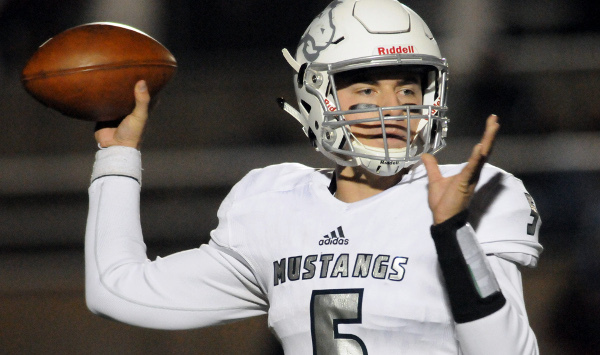 Blue Valley North coach Andy Sims talked to major college coaches across the country regarding senior quarterback Graham Mertz, the third-ranked signal caller in his class and widely considered the state’s top prospect. Sims spoke with every Big 12 and SEC staff, along with powers such as USC, Stanford, Ohio State, Michigan and Wisconsin. Michigan coach Jim Harbaugh, himself an accomplished quarterback in college and pro, asked Sims a simple question: “Coach, why should this guy be our quarterback?” Sims provided Harbaugh with the same answer he has given others. “Because he is a quarterback, and I don’t care if he can throw a football,” Sims replied. Sims, a college linebacker and former defensive coach, broke the response down further. All NFL quarterbacks are tall and have big arms. It’s not about throwing a deep out route. All top signal callers can make the throws. Sims views that daily with Mertz. He headlined Blue Valley North’s first ever state football title last fall. The 6-foot-3 Mertz passed for 3,684 yards for the 9-4 Mustangs. In the 6A semifinals, North avenged a regular season loss to Blue Valley with a 44-37 double overtime victory. In the title, Mertz had 462 yards and four touchdown and the game-winning score in the last minute to beat Derby, 49-42. “I think that he’s done a fantastic job, and his family has done a fantastic job of enjoying the recruiting process but never taking their eyes off of what is the best four-year college for him for the next four years of his life,” Sims said. On Thursday, Mertz starts his final high school year against his former team in a high-profile Week 1 Eastern Kansas League matchup. Blue Valley North is ranked fourth in 6A, and plays host to Bishop Miege, first in 4A-I. Miege is the four-time defending Class 4A, Division I champions. The Stags graduated their prolific signal caller, Carter Putz. He set multiple Kansas single season and career passing records and is playing baseball for Notre Dame. Mertz backed up Putz before transferring. As well, longtime Meige quarterback guru Justin Hoover left for Shawnee Mission East, and is the head coach after Fred Bouchard left in late summer. Senior quarterback Sam Pedrotti earned captaincy for this fall and will start for the first time. Miege again has a bevy of Division I talent, including junior wide receiver Daniel Jackson and sophomore wide receiver Phillippe Wesley. Jackson had a breakout year with 54 catches for 1,270 yards and 16 scores. Wesley started as a freshman with 21 catches for 398 yards and nine TDs. Jackson has offers from Notre Dame, Iowa, and Iowa State, among others. Wesley has especially impressed Holmes in camp and already has an offer from Arizona State. Junior running back Brison Cobbins delivered 119 carries for 1,294 yards and 15 scores. Miege easily led 4A-I in offense at 50.3 points a contest in a 13-0 year. With Hoover gone, seventh-year Miege head coach Jon Holmes returns as the play caller with assistance from Travis Grosdidier (passing game) and Andy Walter (run game). Walter formerly served as offensive coordinator at Shawnee Mission East. Miege is 50-2 in the last four years and is the heavy favorite to again repeat in 4A. The Stags open the season on a 25-game winning streak. The Stags have won six straight versus Blue Valley North, though the last two meetings were 24-6 and 33-14. Holmes is aware of the predictions and the social media discussion regarding the Stags’ dominance. Last year, he spoke with Chris Klieman, the head coach of FCS power North Dakota State. The Bison won five straight titles from ’11-15, then fell short in ’16 before last year’s crown. Miege’s offensive line has two of the other five captains in seniors Josh Meurer and Taylor Poitier. Meurer is a three-year starter at right tackle, while Holmes labeled Poitier probably the team’s most talented lineman. Miege has stacked talent defensively, too. Senior Dylan Downing has received Division I interest after he earned EKL Defensive Player of the Year honors after 142 tackles. Downing and senior defensive back Jaylen Scruggs round out the captains. Junior Ty’quez Agnew-Whitten, a Topeka transfer last year, is usually the only one playing both sides of the ball and has seen time at safety and running back. The defensive line returns multiple key players, including seniors Jalen Williams, Sean Ryan, Max VanMeter and junior Mason Weber. Williams has elicited comparisons to Shane Ray, former Miege and SEC Defensive Player of the Year at Missouri. Ray currently plays for the Denver Broncos. Williams led with 26 TFLs. Zach Mann, a former assistant at Division II William Jewell College, is in his second year coaching the defensive line, and coordinator Jim Giokaris returns for his seventh year. “Could be one of the best defensive lines that we have had,” Holmes said. For Blue Valley North, the Mustangs have three offensive and two defensive starters returning, including Mertz. Junior Jack Stallard – a FCS-caliber player in Sims’ eyes – is a three-year starter and anchor up front. Still, Sims believes, like ’17, that multiple players can step up. “That’s what makes high school football so cool in my mind is there’s kids all across the state right now that were JV players last year, and this year is going to be their chance to go out there and have their senior year,” Sims said. The Mustangs were No. 6 in 6A offense at 38.1 points per contest. Senior Austin Karns will start at center, and senior Jaylin Hunt will play guard. Junior Garett Aimutis started multiple games and played on the defensive line in ’17. Sophomore Jaxson Townsend is a sophomore starter up front. Senior safety Kendall Hargens is back after 55 stops. Last year, Nigel Roberts had more than 1,000 yards as first-year starter and plays at Northwest Missouri State. Dylan Freberg more than doubled his receiving output from ’16, cleared 1,000 and is at Kansas. Alex Garcia didn’t play as a junior and recorded 300-plus receiving yards in ’17. This season, Sims expects senior Cameron Burt, a returning wide receiver, to emerge, along with senior wideout Danny Nam. Senior Deland McCullough is a transfer and the son of the Kansas City Chiefs’ new running backs coach. He has committed to Miami (Ohio) as a safety and should help out offensively, too. Burt (30 catches) is expected to take Freberg’s spot and Nam will replace Roberts after limited time in ’17. Sims, in his fifth year, has consistently had big passing numbers with multiple receivers having high production each fall.